2” x 2” --- 13/16" x 1-1/2"
Custom thicknesses, sizes, and slots are available upon request. 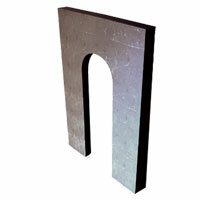 Specify thickness, length, width, type of steel, slot size and location of slot. Copyright © 2019 RKL Building Specialties.